With Elearning evolving every day, the role of Learning Management System (LMS) has become the spine for Learning and Development professionals to make the best out of online training. With over 600+ LMS providers in the market, choosing the right LMS that matches your organizations training needs is a challenge in itself. Evaluating the short- and long-term effects of LMS implementation could be the key criteria as its deployment knobs the corporate’s training requirement which aligns with the business and performance goals. In this blog, we will delve into the key parameters that might save your time and cut confusion in searching the best Learning Management System. Put your learning and development objectives upfront: Having clarity on training goals and expectations can help you find the right LMS that meets your training needs. Prior to selecting an LMS, you need to carry out training needs assessments, evaluate technical infrastructure and limitations. The clearer you put down the LMS requirements, the easier it is to evaluate products. What flexibility factors you need from LMS? These are several factors to consider after documenting your L&D requirements. Easy to Use Interface: Software applications must be simple to access for high acceptance and long-run in the market. Similarly, an LMS platform must be designed in a simple way as it is very important for a course creator and also the learners to use it easily. It must provide an intuitive user interface to easily create, deliver and sell online training courses. Customization and Branding: Does the LMS allow you to customize the look and feel? Will it allow you to fully customize the logo, color schemes, themes and layout to suit your company branding. These are the few questions that need to be raised. Responsive Design: What devices your audiences are using? Is the LMS compatible to different devices? With multi-device and mobile learning gaining momentum, this will be a relevant question to be raised. Tracking and Reporting Capabilities: There are many free LMS platforms which allow organizations to publish content but do not provide detailed reports of learners and required tracking tools. Choose LMS platform that gives the Administrators the ability to generate automatic reports to track learner’s progress. Security: Providing security for software that works on publicly accessible server is quite a complex task. Ensure security by assigning security protocols like SSL and include many other security options like passwords and watermarks. Evaluate LMS vendor’s approach towards security. Will the LMS grow with the needs? After evaluating the factors you need from LMS, following are the elements to consider for choosing long run platform. Scalability: Scalability can serve higher number of learners without any compromise in performance. Make sure your LMS is technically and economically scalable considering the future developments. Future Updates: Future training needs will surely vary. Ensure to check whether your LMS provider keep updating the LMS to technology advancements. Give it a Try: When you feel satisfied with the scalability, ask for a free demo. Feel free to ask the LMS vendor for a live demo or a trial period that will allow you to practically go through the LMS. Check whether the features and functions are in accordance with your learning and development needs; make sure you also measure usability and scalability you are looking for. This will provide a proper forecasting before choosing an LMS. Every organization has a unique set of reasons to choose their LMS. 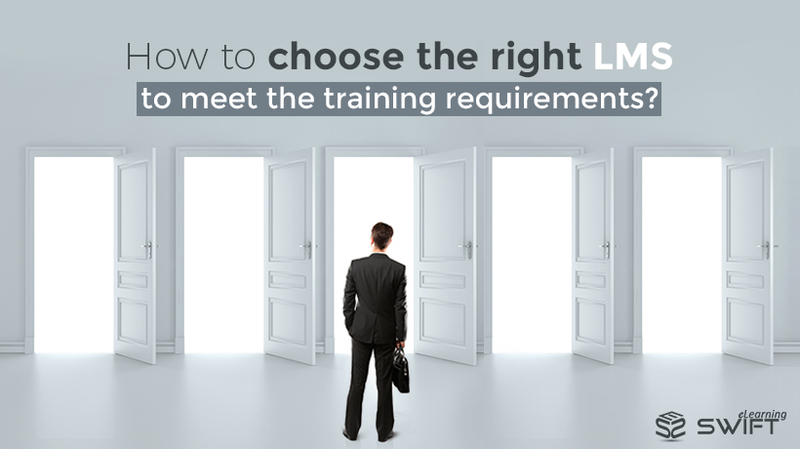 Regardless the reasons behind the choice, these funneled parameters help you get the best outcomes in terms of time, cost and quality in choosing an LMS for your training needs. Swift LMS is flexible, quick to deploy, user friendly and could be the best LMS that allows you to create a remarkable online training experience for your audience. Here at Swift, we help our clients implement cost effective eLearning solutions that really make a difference. Click the button to get full access to our LMS.